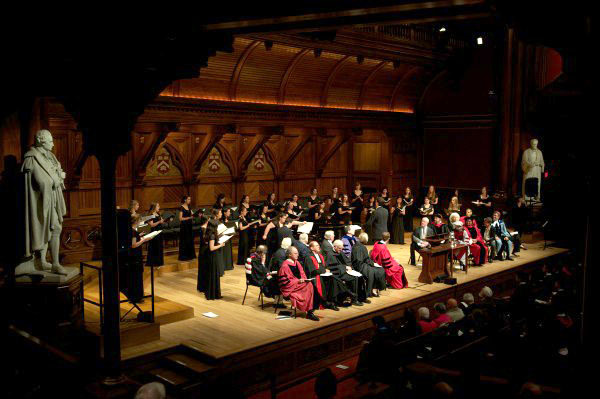 The Radcliffe Choral Society sings behind the Phi Beta Kappa officials, honored guests, and speakers during the literary exercises in Sanders Theatre. Enter the Phi Beta Kappa students, wetly. President emeritus Derek Bok—finally invited to speak at this, his twenty-second PBK ceremony—checks the text of his oration; President Drew Faust is seated beside her predecessor. 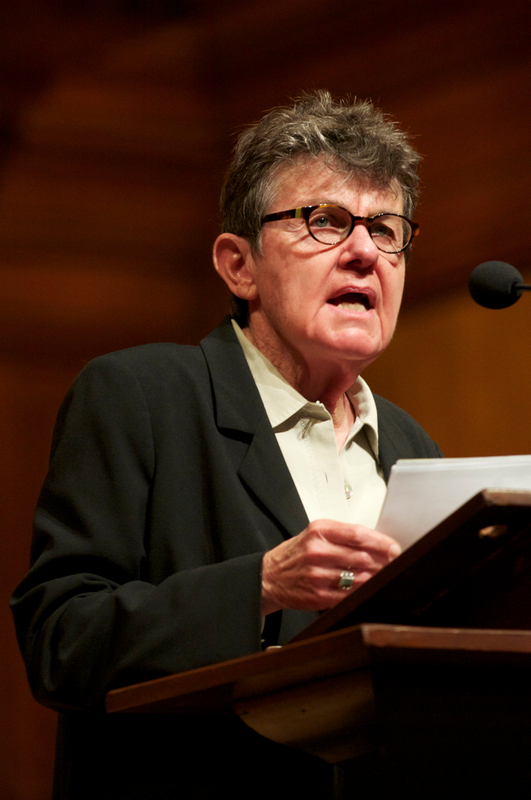 Watch Kay Ryan read "Graduation Garland"
Download a PDF of "New Rooms"
Watch Derek Bok deliver "The Price of Democracy"
Read the text, as prepared, of Derek Bok's Phi Beta Kappa oration. Poet kay ryan and orator Derek Bok addressed members—new and old—of Harvard’s Phi Beta Kappa (PBK) chapter and their guests on Tuesday morning. 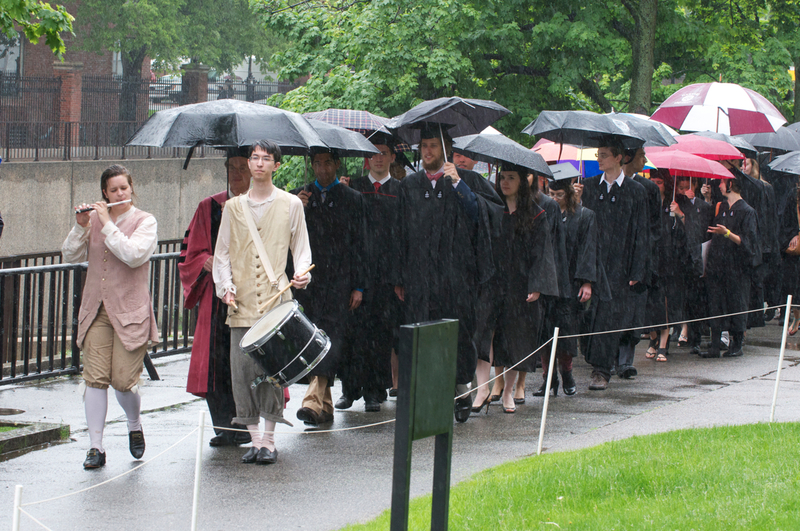 The ceremony—the 222nd PBK literary exercises for the College—launched the formal Commencement activities in the University’s 375th anniversary year. Ryan is a two-term poet laureate of the United States; Bok is the only two-term president in Harvard’s history (he served from 1971 to 1991 and 2006-2007). Each introduced humor into what were, at times, dark and sobering presentations. During the formal business, Alpha Iota Chapter president Logan McCarty (director of physical-sciences education, lecturer on chemistry and chemical biology, and lecturer on physics) directed the ceremonies. The Reverend Doctor Wendel W. Meyer, acting Pusey minister in the Memorial Church since the death of the Rev. Peter J. Gomes (Meyer's appointment ends June 30), offered the invocation. The music—Norman Dello Joio’s “A Jubilant Song,” based on Walt Whitman’s “A Song of Joys,” and “Hark, I Hear the Harps Eternal,” an early American hymn—was provided by the Radcliffe Choral Society, conducted by Andrew Clark, director of choral activities. In his introductory remarks, McCarty looked ahead and wondered whether liberal-arts education would survive. It is a model of education that offers "unique advantages both to individuals and to society," he said, but with public education facing severe challenges, it is by no means assured that the model will last. If too few citizens in the future have had a liberal-arts education, he warned, its value might decline, rather than appreciate—as employers, for example, asked job candidates just who was this Adam Smith they studied for their senior theses, and what was a senior thesis, anyway? He would return to this theme in introducing the poet. David Mooney, Pinkas Family professor of bioengineering, who works at the frontiers of cell and tissue engineering. (Read about his research in the Harvard Magazine feature “Life Sciences, Applied” and this account of his cancer immunotherapy devices.) His nomination cited Mooney's ability to give undergraduates "experiences and opportunities that are usually reserved for graduate students," from advanced laboratory engagements to practice in writing grant applications. Emma Rothschild, Knowles professor of history and director of the Center for History and Economics (based at Harvard and King’s College, University of Cambridge), who focuses on eighteenth-century economic history and thought. Her most recent book, The Inner Life of Empires (Princeton), traces one extensive, globally influential Scottish family at the dawning of the British empire and the Enlightenment. Rothschild was cited for engaging students from diverse fields—history, economics, applied mathematics, social studies, and more—in her course on the history of economic thought, and for advising an equally broad range of undergraduate scholars, finding them professorial mentors in other fields where necessary. Charles Donahue Jr. ’62, Freund professor of law, a scholar who has taught first-year property law for 40 years, as well as ancient, medieval, and early modern legal history (English and Continental European) at Harvard Law School since 1980. Donoghue noted that Donahue's scholarly melding of historical and legal studies served as a reminder that the intellectual distance between the law school and the College is not, and ought not, to be greater than the slight physical distance separating them. He cited in particular Donahue's masterly work on the law of marriage. James Nohrnberg ’62, JF ’68, a self-described “semiretired” professor of literary criticism in the University of Virginia’s English department, where he has taught about the Bible, Renaissance English poetry, and Shakespeare since 1975. He was a Junior Fellow at Harvard’s Society of Fellows from 1965 to 1968. Patrick Thaddeus, Wilson professor of applied astronomy emeritus, a radio astronomer and scholar of galactic structure and interstellar gas. 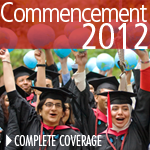 He is also affiliated with the School of Engineering and Applied Sciences, as professor of applied physics. Donoghue noted that Thaddeus, who has published nearly 400 papers, had himself discovered one-quarter of the molecules proven to exist in space. Thaddeus is retiring at the end of this academic year. The Honorable William G. Young ’62, LL.B. ’67, a United States trial judge on the U.S. District Court for Massachusetts since 1985 (following seven years of service as associate justice on the Massachusetts Superior Court). Donoghue said Young "wrote a senior thesis on the American Civil War, as President Faust will be pleased to learn" (Faust, seated on the stage, is a prominent historian of the prewar South and the Civil War itself). 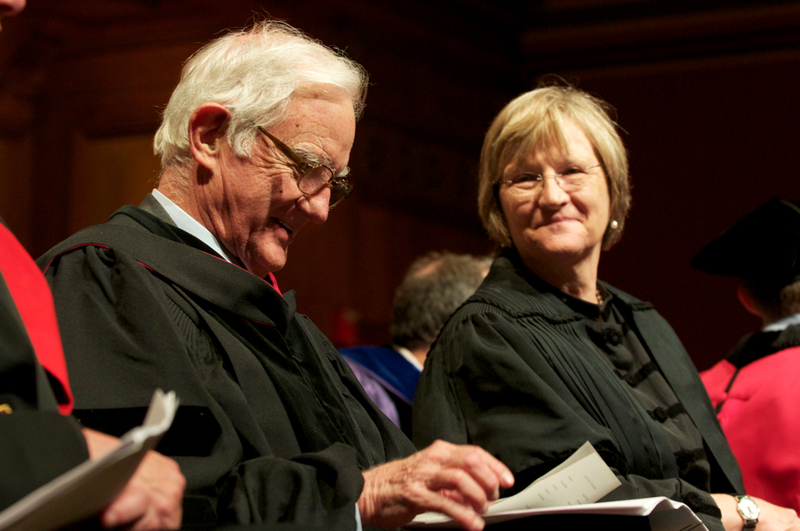 Young is known as "the education judge" for his teaching at Harvard, Boston College, and Boston University law schools, Donoghue noted, and for his devotion to continuing legal education. 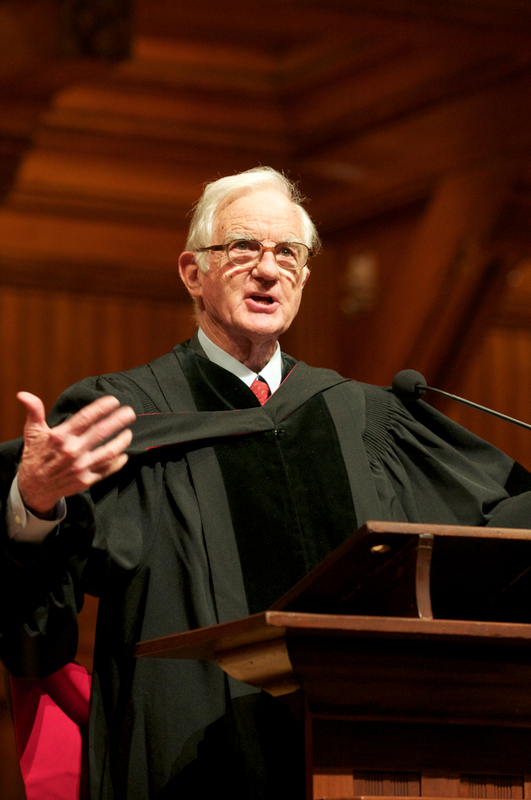 He was president of the Associated Harvard Alumni (now the Harvard Alumni Association) in 1976-1977. And the poet, Kay Ryan. The Poet: A "Graduation Garland"
McCarty, in introducing poet Kay Ryan, noted that she had decided against completing her doctorate in literary criticism because, as she put it, she was "appalled at being a doctor of something I couldn't fix"—a fine introduction to her way with language and her mordant wit. After summarizing her poetic career and the many honors it had won her, McCarty noted—echoing his opening remarks—that she had taught basic English at the College of Marin, a California community college, for more than 30 years, work she described as a "nitrogen-fixing" activity for society, enriching the soil and the community as a whole. He noted that Ryan is known for brief poems, frequently of 20 lines or fewer, often of six syllables or fewer per line; for wordplay, including what she calls "recombinant rhymes" hidden in the middle of lines; and for humor. But that humor, she has said, is "a fairy gift" that often turns dark upon reflection. And so it was in her selections for the occasion, cutting against easy celebration, with light-seeming poems that landed with the impact of darts. "Counsel"—on taking advice, and on the way the human body does not readily absorb iron in tablet form; she chose the poem, she said, to "discourage me from thinking you would take any of this in." "Chop"—as in a Chinese stamp, on "the fleeting nature of glory." "Failure 2"—although the PBK students may not have experienced much in the way of failure so far, she cautioned, some failures would surely come their way, and so she read a poem "celebrating failure" in the spirit of being prepared for anything. "Yeses"—The students, she said, "may have met in your careers with an unending avenue of 'yeses,’” but such affirmations can turn out to be surprising; she cautioned them to "seek not uninterrupted universal approval" in everything. "Atlas"—“a tender poem for the overachievers," a reminder that one overachieves alone, like Atlas, "the great icon of overachievers." "Home to Roost"—a reminder that the chickens who come home to roost are "always bad chickens," impulsive actions. The poem captures "some wisdom that I gained too late," a reminder that one's actions "do accumulate and have an impact." After reading it, Ryan added impishly, "Just sayin'…"
"Blunt"—as in not sharp; "to remind you that happiness might be attained by changing your criteria." "Patience"—a lesson Ryan acknowledged not wanting to learn herself, that "patience is not just necessary but productive." "New Clothes"—as in the emperor's garb. 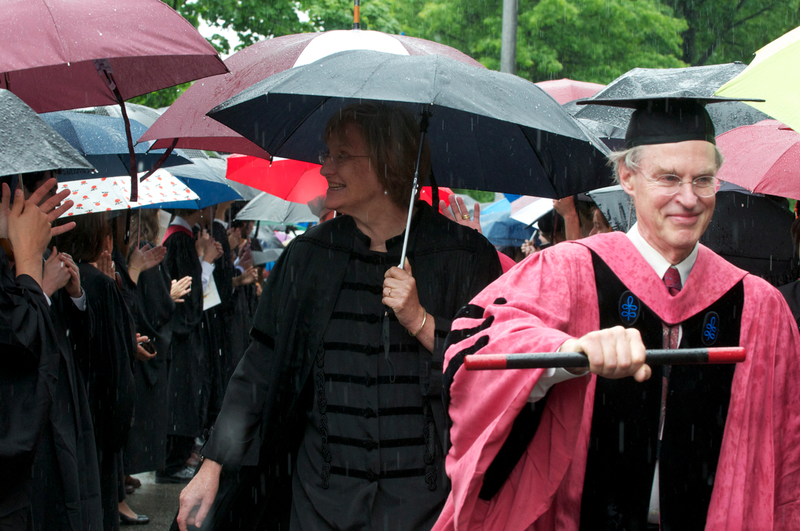 The invitation to read at Harvard, she said, gave her a "dangerous" sense of "self-flattery." Hence this caution. "Doubt"—“I always have plenty of material on this subject." "New Rooms"—perfect for students leaving their familiar Harvard rooms for new quarters, "and it's really bad news for you" (a line that evoked appreciative laughter). And finally, "Octopus"—a "cheerful evolutionary poem" suggesting that "things could possibly work out for the best," ending on a vivid note about the capacity of "the strange intelligence." Watch Ryan recite "Octopus" below, or listen to all 12 poems. Making note of the circumstances, Bok called his appointment as orator "a sort of reward" for having attended 21 prior literary exercises "without ever being allowed to utter a single word." Now, he joked, he would make the most of the opportunity. He recalled the glory days of the ceremony, during the nineteenth century, when the poet routinely read from his works for more than an hour, and the orator went on at greater length than that. Anyone present with a sandwich, Bok said, might want to consume it now to fortify herself for the coming address. In once case, he observed, a Cambridge resident recorded in her diary that she attended a Harvard president's inauguration; ducked out after the first 15 minutes of his talk; walked across town to a relative's wedding and the attendant celebrations; walked back; and was comfortably in time to hear the president still summarizing his own most brilliant points. And with that, Bok turned to his brisk, 20-minute address. [I]n the United States, unlike virtually every other well-established democracy, poor people vote at only half the rate of their more prosperous fellow citizens. In a representative democracy, why should we expect politicians to pay much attention to those who do not vote? We grumble about gridlock and the failure of Congress to agree on ways to solve our problems—yet a clear majority of Americans prior to the election of 2010 said that they preferred politicians who stick to their positions without compromising. We deplore the polarization in Congress between liberals and conservatives. But a major cause of polarization is that so few people bother to vote in primary elections. His query, he reported, was fitfully fruitful. Public service is valuable, but may not engage others in democratic governance. Once active intermediary groups—unions, churches, and other civic entities—are themselves weakened, with diminished membership and participation. Schools, ever more focused on preparing students for occupations, have reduced civics coursework, with perhaps predictable results: “In a recent survey of 14 leading democracies, political interest among the youth rose over the past few decades in 13 of the participating nations. Only in the United States did interest decline.” The vision behind the education set-aside in the Northwest Ordinance (“Schools should be forever encouraged…because knowledge is necessary to good government and the happiness of mankind”) is all but unrecognizable in the current environment. Although one can hardly understand many important policy issues without knowing something about economics, fewer than half of American undergraduates take a single course in the subject. Barely a quarter take a course in American government and politics. Smaller fractions still have studied international relations or political philosophy. Small wonder. Fewer than one-third of college freshmen think that keeping up to date with political affairs is important and fewer still discuss politics even occasionally. In short, education for citizenship in our colleges is now treated much like choral singing or intramural basketball—available for those who are interested but easily avoided by those who aren’t. There is, of course, one difference. Students need not become choral singers or basketball players in later life, and nothing turns on whether they do so or not. But citizenship is not an option. Almost all college students are citizens and much does turn on whether they choose to prepare themselves for the responsibility. Apparently, few colleges encourage them to do so. At the conclusion of the exercises, Rabbi Doctor Jonah C. Steinberg, executive director of Harvard Hillel, gave the benediction.